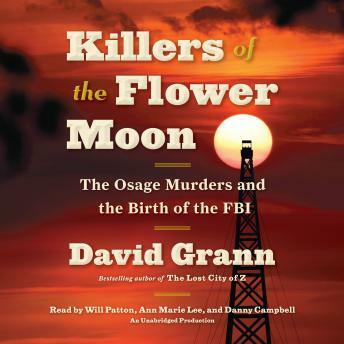 Listen to "Killers of the Flower Moon: The Osage Murders and the Birth of the FBI" on your iOS and Android device. Fascinating look at evil and power and shame. The only consolation from the heartbreak is that we live in a different world. For now. I found the book to be very interesting and eye opening. I am sorry to say that I knew nothing of the Osage murders. The amount of research that must have been done for this book is remarkable. Wonderfully written account of the historical events and perspectives. As an Osage tribal member and family who was impacted by these murders, this book was well researched and caught the emotion of the times. I liked this book and believe it's a story that needed to be told, and heard. Very interesting, however the author went on a 2 hour long rant about J. Edgar Hoover and how horrible he was, even though the only Osage murders solved were those solved by the FBI. (under the direction of J. Edgar Hoover) If it weren't for this I probably would have given it a four or five. Good book, but the rant bogged it down for quite a while. This book started out a little slow. I did not care for the first narrator, and the author was setting up the story with so many characters and facts that it was tough to follow. However, when the second narrator started, I really began to enjoy this book. It was great to learn about the origins of the FBI and how they were dedicated to solving the Osage murders. The third narrator was also really good and I enjoyed hearing about the continued investigation long after the initial one started. Overall very good read...just need to get past the first part. Such an important read.. I can’t believe I didn’t know about this treacherous chapter of American history. Perfectly combines my loves of history, true crime, and social justice. You won’t regret listening! The topic of this book is interesting and well researched. However it is a bit dramatic in parts and the narrators are even more dramatic. Wow this book was amazing!! I learned so much about the history of the frontier and American Indians in the 20th century. The narrators were fabulous and the story kept me so captivated with suspense I couldn’t stop listening. Even to the last hour I was in awe that this was all true and a part of our horrible unspoken history! I would recommend this to everyone!! As a native born Oklahoman, with relatives from the 1800s living in various locations throughout the stated I found the book fascinating. More so because some of my family lived in that area. Conspiracies to do evil have been with us from the beginning of time.